I’m very sorry to see that Elizabeth May is very sorry about livening up the deadly dull Press Gallery Dinner, with a choice comment about Stephen Harper and his cabinet. Green Party Leader Elizabeth May says she is ‘very apologetic’ about remarks she made on the weekend that included profanity and insulted the federal cabinet about how it has treated Omar Khadr. Because while she does owe everyone an apology for playing the theme song from “Welcome back Kotter” — that was a faux pas — in the matter of Omar Khadr she was only speaking truth to power. Khadr does have more class than the whole federal cabinet. And it’s Stephen Harper who has the Big Omar Problem. The day before that news conference 49% of those who voted in a “Power and Politics” poll thought he was a threat to society. The day after the news conference more than 70% said they had changed their minds about him. That huge and sudden swing is also reflected in the comment pages of newspapers all over the country. And in letters like this one. Tut-tutting like sour Victorian schoolmarms, Prime Minister Stephen Harper and his talking point-equipped ministers speculate that Omar Khadr is a danger to Canadians. Out on bail, Khadr presented himself last Thursday as an articulate, reasonable young man with no apparent grudge over his questionable imprisonment as a child, including torture at the hands of U.S. government agents. If those torturers enjoyed what they did to Khadr and now walk free in the U.S., they may visit Canada where we can speculate that their urges to inflict harm could lead them to commit awful crimes here. And when Stephen Harper loses the support of a Sun columnist, in Calgary of all places, you know he’s in trouble. This unrepentant redneck — whose attitude towards the ‘War on Terror’ can be helpfully summed up in this handy, seven-word phrase, ‘Kill em all, let God sort them out’ — has one thing to say after notorious war criminal Omar Khadr has been turned loose on the Canadian public. 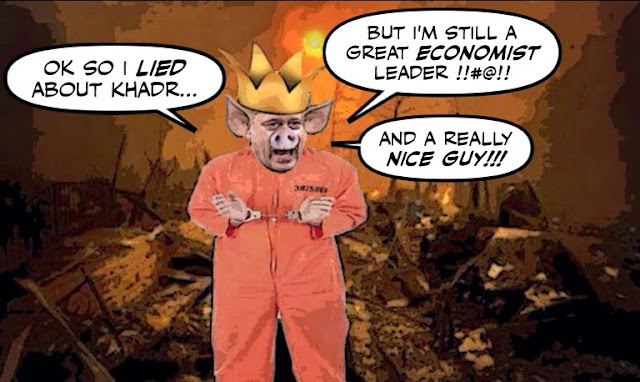 For his attempt to demonize Khadr appears to have backfired big time. And when in a few days time the Supreme Court delivers a judgement on whether Khadr should have been treated as a young offender, rather than being sent to an adult prison. And will almost certainly rule in his favour. Stephen Harper will be left looking like even more of a bully. And even worse for his chances of winning the next election, it will surely make many Canadian wonder whether they can trust ANYTHING he says about ANYTHING. Which raises a fascinating question. Could the Guantanamo Kid, who Harper tortured for so long for crass political purposes, turn out to be his nemesis? And wouldn’t that be ironic? The child soldier in the orange jumpsuit came back to Canada to torture Harper. Yes indeed, wouldn’t that be poetic justice? Liberated by Canada’s most famous prisoner. You Harper defenders ought to take off the blinkers. Unless you’re a 1%’er, he’s screwing you. And he has no mandate to remake the country. Cut the census, cut science? He’d cut universal healthcare if he could get away with it. Typical lefties always in a rush to support abhorrent behavior, whilst vilifying those who disagree with their point of view. The left has become the new fascists. Glad to see this, good stuff. What is galling is Raitt, trying to patronize a woman who has more honesty and intelligence in her little finger than anyone in the Harper government. And so glad Elizabeth got her punchline recorded. It will get repeated many times in the coming weeks and in the run-up to the election.